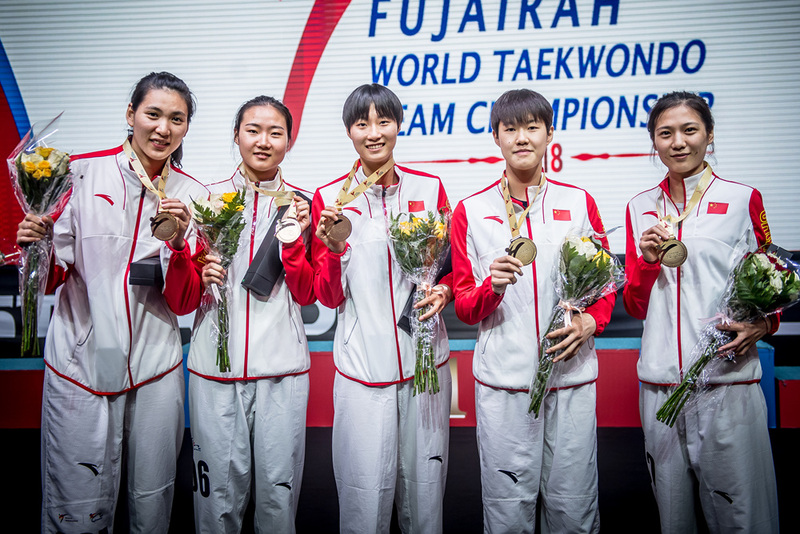 FUJAIRAH, UAE (Nov. 25, 2018) – Defending champions China comfortably retained the women’s team title while defending champions Iran won the men’s team title by a razor-thin margin in the final seconds, and last-year’s runner-up, Russia, seized the mixed gender title at Fujairah’s Zayed Sports Complex on Sunday. 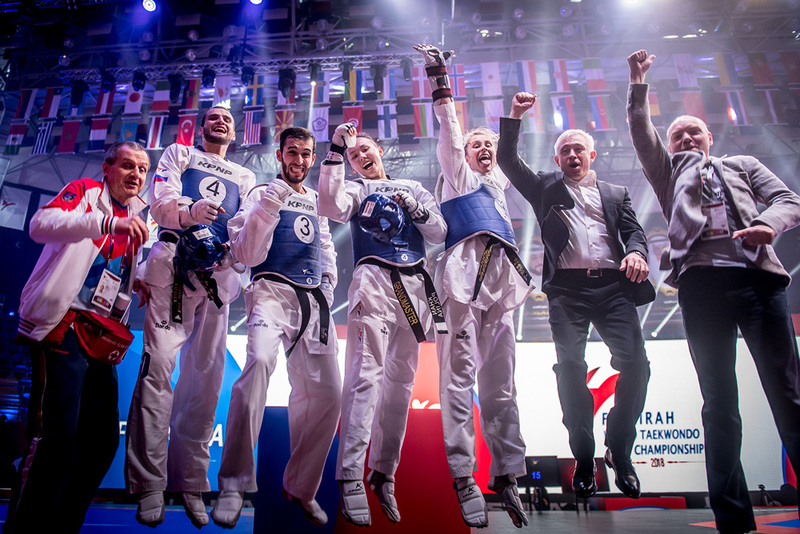 There were thrills and spills aplenty on the 2018 World Taekwondo Team Championship second and final day. 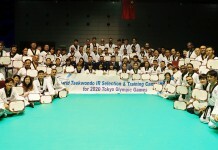 Team play is faster and more furious than the individual game, making it taekwondo’s most crowd-friendly format. Men’s and women’s teams feature five players, bouts last four rounds. In the first, fighters face their opposite numbers; the subsequent rounds feature substitutions flagged by coaches. Mixed-gender bouts last three rounds, with teams of three males and two females. This final was a replay of 2017, pitting defending champions Iran against runners-up Russia. 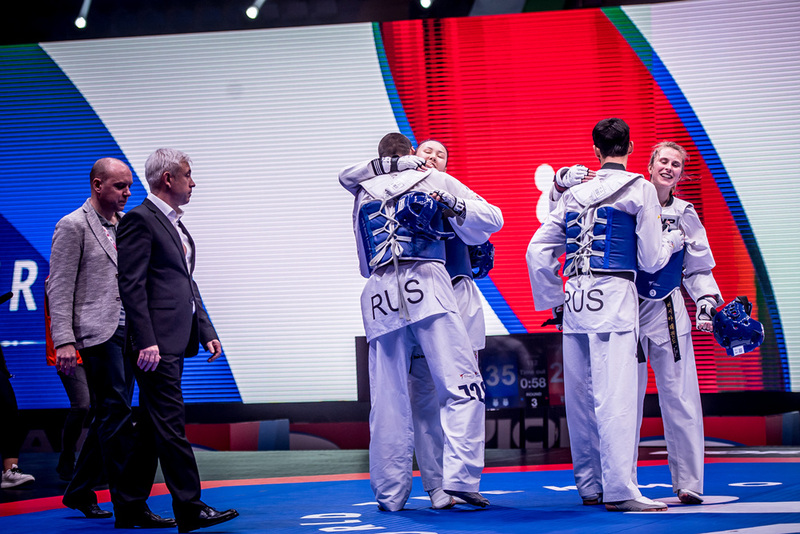 Earlier, Russian had knocked out Azerbaijan and Iran had taken out Kazakhstan, while China, Cote d’Ivoire, Korea and Uzbekistan had all been eliminated in Saturday’s preliminaries. It was a spirited, anyone-can-win battle from the start. The players in the first round fought hard in the push, kicked with power, and the crowd loving the action. Round 1 ended 10-5 to the defending champions – but this was not going to be a wipeout. With 35 seconds left on the clock in the second round, the score had equalized to 12-12 – drawing chants from the Russian crowd. In the third, the action got rougher, with fighters tumbling off the mats and Russia drawin ahead 16-13. 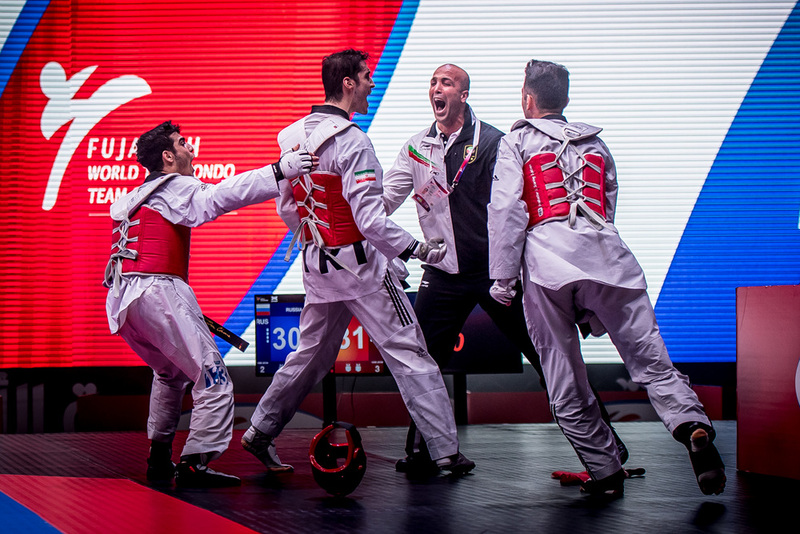 Iran made full play of its feistiest fighter, Abolfazl Yaghoubi, whose yelling attack drew Iran’s points up to 15-16. Then Iran pulled ahead with a head kick 18-16; Russia briefly bought it up to 18-18, before Iran again drew ahead 20-18. Then Russia equalized yet again 20-20, then led the board at 22-20 – but only briefly With a fall it was 22-22, then 23-22 to Iran. The round ended 23-22 to Iran: it was anybody’s guess how this war would end. 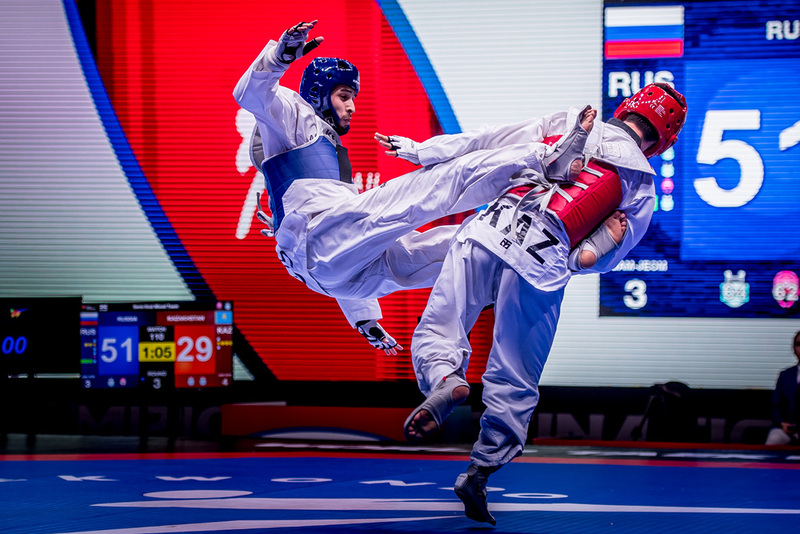 In the final round, Russia pulled ahead 24-23 with a thwacking body kick, as the Iranians shouted instructions to their man. There was scrappy play in the push – yet again, Iran played Yaghoubi, who delivered the necessary, taking the board 25-24, then 26-24, to Iran. Russia went into all-out attack mode but the Iranians were scoring the points: 27-24, then 29-24. The game looked like it was drawing away from Team Russia – but in the last minute they raised their score to 28. With 45 seconds remaining, just one point separated the teams and in the last 20 seconds, Russian went up, 30-29. By now, the crowd was literally screaming. 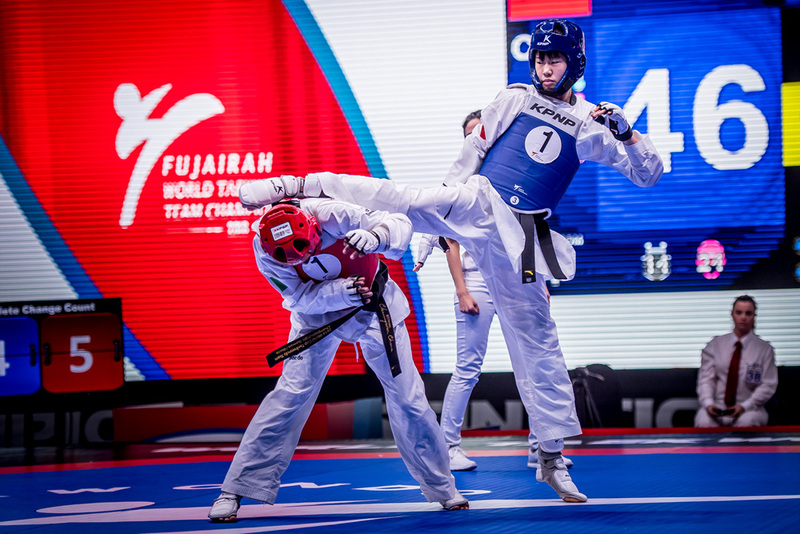 With just 3 seconds left Iran’s Madhi “The Terminator” Khodabakhshi – a specialist in crisis taekwondo – scored, ending the war 31-32 to Iran. It had been nail-biting finish to a match that could have gone either way. Russia took a very well deserved silver while Kazakhstan and Azerbaijan won bronzes. Defending champions China – who have won this title for three consecutive years – had a by in the semis, after Russia withdrew. The left them fresh to face Cote d’Ivoire, who had earlier defeated France, in the gold medal match. 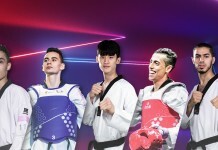 Korea and Morocco had both been eliminated in the preliminaries on Saturday. The taller, leggier Chinese took an early lead, and never relinquished it, despite a brave effort from the attacking Africans, who carried the fight forward in all rounds, with World Champ Ruth Gbagbi, playing a central role in the game plan. The second round was 32-10 to China. In the third, Cote d’Ivoire charged forward, fighting ferociously, but the Chinese were landing head shot after head shot. At the onset of the fourth and final round, it was 57-22 to China. The rout continued in the last round with China now starting to play a more forward fighting game. In the last nine seconds, the coach played Gbagbi yet again: Summoning her last breath she whirled across the mats with a series of jumping spin kicks, but the point gap was far too great to overcome: The match ended 77-41 to China. Silver medalists Cote d’Ivoire – who had to fight a fresh opponent – won the hearts of the crowd. But massive credit to Team China, who have mastered every nuance of this format, and who currently look unstoppable. Russia and France took bronzes. This year’s field comprised China, Cote d’Ivoire, Kazakhstan, Korea, Morocco, Russia and Turkey. In the preliminaries, Russia had a by; Kakakhstan dismissed Morocco; Cote d’Ivoire had a by as Korea dropped out; and Turkey defeated defending champions China. In the quarter finals, Russia knocked out Kazakhstan, then Cote d’Ivoire took on Turkey. This semi-final clash was a scorching, spectacular battle: Turkey had accuracy while Cote d’Ivoire unleashed a creative, attacking style of play. Turkey won 72-58 – stratospheric scores – but once again, Cote d’Ivoire energized the crowd with indomitable spirit and spectacular technique. That left Turkey to face Russia for the 2018 title. Turkey shrugged of their tiredness and led the first 9-7, but as the substitution phase got underway, Russia revved up, taking an 11-9 lead to loud applause. 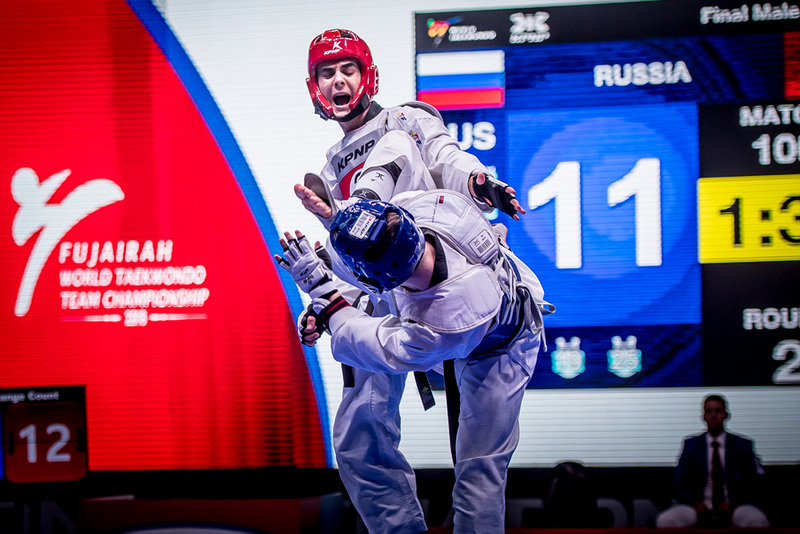 The board went to 12-12, before Turkey drew ahead 14-12, then the fight seesawed and Russia went 16-14 up. The Russians fought with a relentless forward attack; the Turks uncorked combination, head and spin kicks. The second ended 24-14 to Russia. In the third, action flowed with fire and fury. The score rose to 25-21 to Russia, then 27-21, then 28-21. Russian support was now thunderous. Flags and feet were flying as the scoreboard flashed 32-21 to Russia with 30 seconds left. Despite a final rally from the Turks, Russia was not to be denied: It ended 35-22 and gold medal for Russia, silver for Turkey. Bronzes were won by Cote d’Ivoire and Kazakhstan.